Trusted for over six years, the Urinator has proven to be the #1 testing device for those looking to pass their drug test. 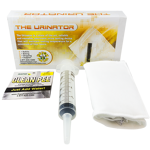 The Urinator is a reusable, self-heating, synthetic urine delivery device that will store, heat, and keep your sample of synthetic urine at body temperature for 4 hours with just two 9-volt batteries. Unlike other devices that rely on using microwaves or heating packs, The Urinator is an all-in-one solution! When you’re ready to provide a sample of fake pee, you can be sure The Urinator has it warmed and ready to flow! The digitally controlled, automatic heating element included in the Urinator will ensure your sample always remains perfectly at body temperature. It can heat a room temperature, synthetic urine sample to 98 degrees in as little as 15 minutes! Once at body temperature, the Urinator will keep your synthetic urine at a perfect 98 degrees for up to 4 hours with just a pair of 9-volt batteries (please note that the batteries are not included with the Urinator so make sure to plan accordingly so you’re ready to use it right when it arrives!). If you have to deliver your fake pee with just a moment’s notice, you won’t have to worry about finding a microwave or dealing with attachable heating packs. Your Urinator will be ready to go whenever you are! Each Urinator comes with one vial of Rapid Clear Clean Pee. 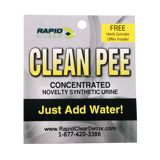 Clean Pee is a dehydrated, concentrated synthetic urine that has all the same compounds and characteristics of actual human piss. Since it’s nearly identical to organic whiz, it even has the same specific gravity, pH balance, and creatinine levels as the urine your body produces. In fact, it’s so realistic, it could even pass for real pee under close examination in a urine testing laboratory! Since the Urinator was designed to be reusable and refillable, you’ll wanna stock up on your favorite synthetic urine so you’ll always be ready to go! Each time you use it, you’ll be able to easily fill the medical-grade pouch with fake pee using the included syringe. After you’ve delivered your faux-whiz, you can use the syringe to rinse out the pouch with warm water. Never use soap or any other cleaning agents to flush out your urine sample because this could harm future samples you may load into your Urinator. Heating synthetic urine has never been this easy and stress-free. With its digitally controlled, automatic heating element, The Urinator is the most reliable solution for storing, heating, and maintaining the temperature of your fake whiz! If you’re looking to take your urination imitation game to the next level, The Urinator is a must-have! The Urinator is reusable and can be refilled again and again using new synthetic urine and two new 9 volt batteries. With the Urinator's self-controlled computer, the Urinator will maintain its synthetic urine at 98 degrees for up to four hours. All orders are shipped discreetly with no indication on the box of what the contents are. We offer overnight shipping for those that need their Urinator right away. All orders placed during business hours are shipped the same day! We ship via UPS to the United States, Canada, and Puerto Rico. Clean Pee is a dehydrated urine that has balanced pH, creatinine, and specific gravity as real human urine would. Just add water when ready to use. 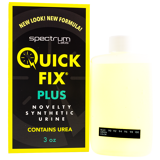 Quick Fix Synthetic Urine Plus is a 3oz 6.2 formulation for those needing an extra ounce of urine. Guaranteed to Pass every time. 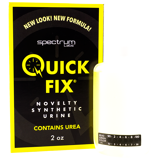 Quick Fix Synthetic Urine is a 2oz pre-mixed synthetic urine balanced for PH, specific gravity and other urine components. Guaranteed to pass every time.